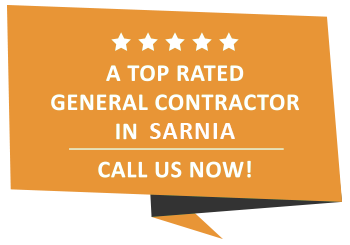 Commercial Contractor | Sarnia, ON | Carosyl Home Additions Inc. Opening our doors in 1981, Carosyl Home Additions Inc. has been serving the business owners of Sarnia for over 36 years. So, when you’re looking for a commercial contractor for your building or renovation project, you don’t need to look any further. No matter how large or small the job is, we’re up for it! Accredited A+ with the Better Business Bureau, we pride ourselves in providing exceptional construction work and customer service. And, as a small company you will always deal directly with the owner and only expect our employees on your property with the exception of licensed electricians and plumbers should we need them to finish the job. Our fully licensed and bonded team is dedicated to the work they do. Commercial construction involves a lot of moving parts, and is an industry that is ever-changing. Because of this, our commercial contractors and builders are learning all the time. Staying up to date on any changes that could provide you with a better, more affordable build is beneficial for everyone! From design to build to completion, the Carosyl Home Additions Inc. team loves to help Sarnia business owners accomplish their commercial construction goals. We’ve worked with all these businesses and more, renovating them to suit their owner’s individual needs perfectly. Making the decision to renovate your commercial property is big. At Carosyl Home Additions Inc. we understand that it’s not always easy as a business owner to get to our offices. Because of this, we offer free on-site estimates, with no obligation to follow through. Interviewing commercial contractors is important when making the best choice for your business. Updating your commercial property in Sarnia is a great opportunity! Not only will you impress clients, you will be increasing your efficiency by fixing all those problems that are stopping you from really thriving. If you are in a competitive industry, a renovation will build buzz and with your new storefront, your competitors will be left in the dust. By modernizing, it’s guaranteed you’ll be ahead of the game and welcoming in new customers in no time. Staying within your schedule and budget is important to us. When we work out a timeline with you it goes on the contract and we follow it. Offering competitive rates, we stand out from other general contractors in our understanding that businesses need to spend money to make money but don’t want to go broke in the process. With 36+ years in the industry, at Carosyl Home Additions Inc. we think it goes without saying that we’re dedicated to our craft. Practicing efficiency at all times, we pride ourselves in being able to work closely with clients to get the job done exactly the way they want. So, give us a call today to see what we can do for you!